Since 1986, audiences around Australia have been entertained with a show performance never matched or duplicated. Make your event complete and increase patrons and clientele at your next event with a professional Freestyle Now stunt show, it is the ultimate action experience. Click here to contact Freestyle Now today. Freestyle Now has your entertainment covered with a variety of high energy stunt shows to maximize your entertainment value. 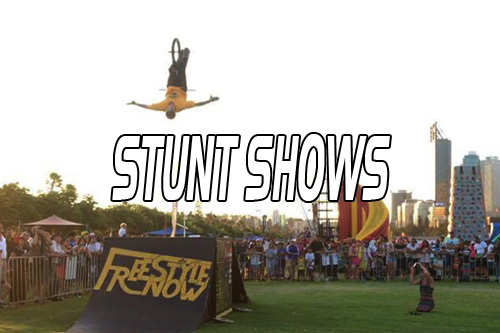 Freestyle Now can bring to your event, Australia’s top action sports stunt show. Freestyle Now stunt shows are high energy action-packed entertainment performances and a proven crowd pleaser for both young and old. 32 years of proven experience. Freestyle Now has show formats to suit your needs and we have the ability to change and adapt any of our shows to meet any special requirements. The show can easily be set up in any location in approximately 1 ½ hours, or less with prior arrangements. The Freestyle Now stunt show is a fully self-contained turnkey presentation, we supply everything except the audience. Our stunt show presentations consist of a fully portable ramp system, crowd control bollards and banners, P.A. system, tagged power equipment, professional announcers, public liability insurance and of course the professional performers. Our goal is to perform an entertaining stunt show for your patrons. Professionalism and courtesy are always paramount. Throughout the awe-inspiring performance from the Freestyle Now stunt squad, the patrons of your event will be on the edge of their seats as they witness firsthand the skill, dexterity and stunts that the professional members of the Freestyle Now stunt squad will present to them. Our professional squad members will assist you every step of the way, from your initial contact, through to maximizing our attendance at your event and even assist with the best way to achieve great results from having the Freestyle Now squad visit your area. Freestyle Now can also supply promotional material and media releases when required. At the time of your event, our squad members will work with you and your staff to minimize our impact on them, allowing for a stress and hassle free run event. Show us the spot and we will do the lot. Simplicity is the key. We fully understand your requirements and always want to achieve the most beneficial and practical results that will make for a great performance. This may be working within a budget, around other performers or within a tight time schedule. Freestyle Now is very safety aware and our show performance can only proceed once all safety checks have been made with equipment and performance area and at the commencement of each show a safety message in conveyed to the audience. Controlled chaos is the best way to describe the flow of the entertainment provided, as this allows the content to be extremely appealing and attention-grabbing. The pace of the shows is fast and action-packed full of stunts. Our professional announcers will get the crowd involved with the performance not only by just calling the tricks the riders perform but by using theatrics and hilarity to get everything connected. A connected crowd is a participating crowd. The Freestyle Now stunt show culminates with a spectacular finish. Our squad members are always friendly and approachable at the end of each performance and enjoy crowd interaction. Admirers of the show performance and squad members can also receive autographs, posters and other merchandise at the end of the show. Freestyle Now has a variety of high energy stunt shows to maximize your entertainment value. Show us the spot and we will do the lot. Controlled chaos is the best way to describe a Freestyle Now stunt show. Freestyle Now has a variety of unique stunt show performances to give you great entertainment value to suit your event, function or promotion. Please contact Freestyle Now if you require more information on which show performance would be best suited to your event or if you require something more as we can supply a custom designed show to suit your requirements. A comprehensive list of our past shows can be found here. Listed below are our popular stunt shows performances. Freestyle Now BMX ramp and jump stunt show. 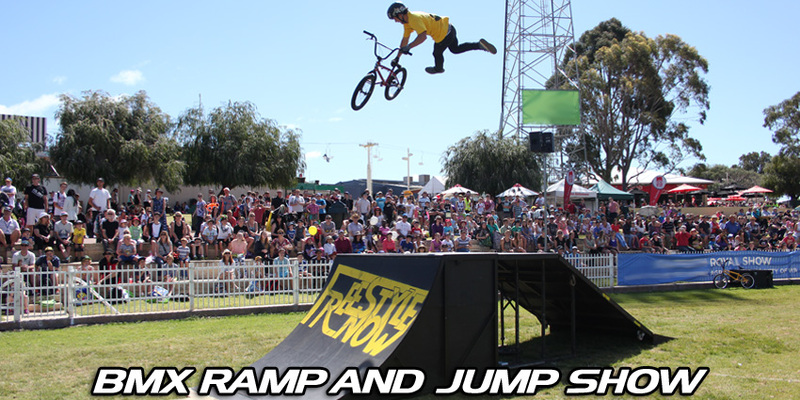 The Freestyle Now BMX ramp and jump stunt show consists of BMX ramp and jumping stunts. This show has 4 professional BMX performers that perform a variety of mid air BMX stunts over a jump. Back flips, front flips, 360’s and no hander’s are just some of the crazy tricks the riders perform. The BMX performers do singular, double and triple routines throughout the show performance. The Freestyle Now BMX ramp and jump stunt show is 10 minutes in duration but can be adapted to suit your event if required. The ramp and jump stunt show can easily be set up in full set up on any flat level surface including pavement, grass, dirt and gravel with an approximate area of 50 meters x 7 meters with the opportunity to discuss smaller sizes if needed. Show set up and pack up time is approximately 1 ½ hours each. With the prior organization, quicker set up times can be arranged to allow for a quick in and out at different venues and shows. All required infrastructure is supplied by Freestyle Now, ramps, crowd control bunting, PA system, power cords (generator if required). This style of show is great for larger areas, such as showgrounds, ovals and indoor venues. The show has been very well received at agricultural shows, festivals, fairs and even half time basket ball entertainment. Please contact Freestyle Now if you require more information. Great for agricultural shows, festivals, fairs and half time sporting events. Freestyle Now BMX flatland stunt show. 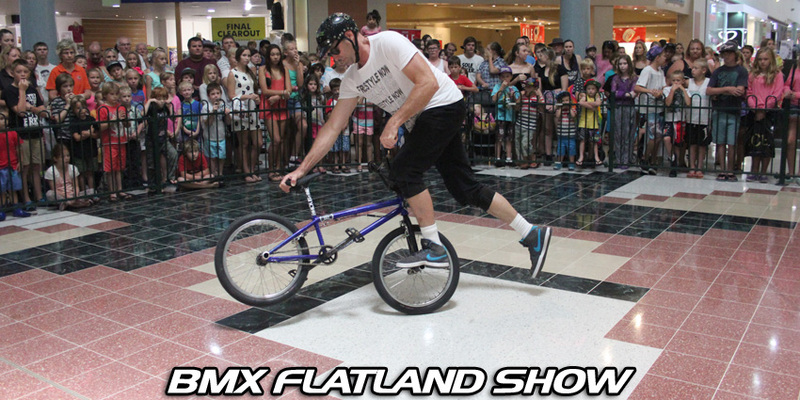 The Freestyle Now BMX flatland stunt show consists of BMX flatland stunts. 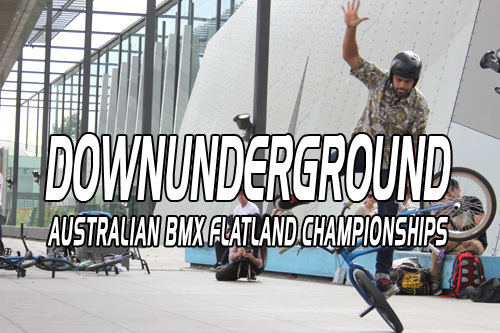 This show has 3 professional BMX flatland performers that perform a variety of BMX stunts on flat ground and do not use any ramps. BMX Flatland is one of the purest forms of BMX stunt riding as riders only use their bikes to perform stunts in many different ways. The BMX flatland performers ride their bikes backwards or forwards on one wheel, in circles and in spins sometimes with the bike in an upright position and sometimes in an upside down position. The style of riding can often leave the spectators bewildered on how a person can ride a bike in such a way. The Freestyle Now BMX flatland stunt show is generally 15 minutes in duration but can be adapted to suit your event. The flatland show is easily set up in full in any location and on any hard flat clean level surface only including asphalt, stages, pavement or cement with an area required of approximately 10 metres x 10 metres with the opportunity to discuss smaller sizes if needed. As no ramps are involved set up is very quick. This style of show is great for small venues or tight areas. The show set up is low impact so it is also suited to venues where a quick set up and pack down is required. The show has been very well received at shopping centres, stage performances, fairs, agricultural shows and festivals. Please contact Freestyle Now if you require more information. Great for shopping centres, stage performances, fairs, agricultural shows, festivals and half time sporting events. The Freestyle Now complete action sports stunt show brings all the popular action sports together and combines them into an action packed show stopping performance. This style of stunt shows consists of professional BMX, scooter and skateboard performers all performing amazing stunts on the ramps and flat ground. This show generally has 7 performers (can be adapted to suit your budget) that perform a variety of mid-air and flat ground stunts that will draw in any crowd. Freestyle Now performers from the BMX, scooter and skateboard sports perform back flips, front flips, 360’s and no hander’s in the air and on the ground it’s backwards or forwards on one wheel in circles and spinning. The performers do singular, double and triple routines throughout the show performance. The Freestyle Now complete action sports stunt show is 15 minutes in duration but can be adapted to suit your event if required. The complete show is easily set up in full on any hard flat level surface only (asphalt, paved, cement) with an area requirement of approximately 10 metres x 40 metres with the opportunity to discuss smaller sizes if needed. Show set up and pack up time is approximately 1 ½ hours each. With prior organization quicker set up times can be arranged to allow for a quick in and out at different venues and shows. All required infrastructure is supplied by Freestyle Now, ramps, crowd control bunting, PA system, power cords (generator if required). This style of show is great for a larger area such as basket/tennis courts, sectioned off roads and paved areas. The show has been very well received at town fairs, agricultural shows and festivals. Please contact Freestyle Now if you require more information. Great for town fairs, agricultural shows, festivals and fairs. 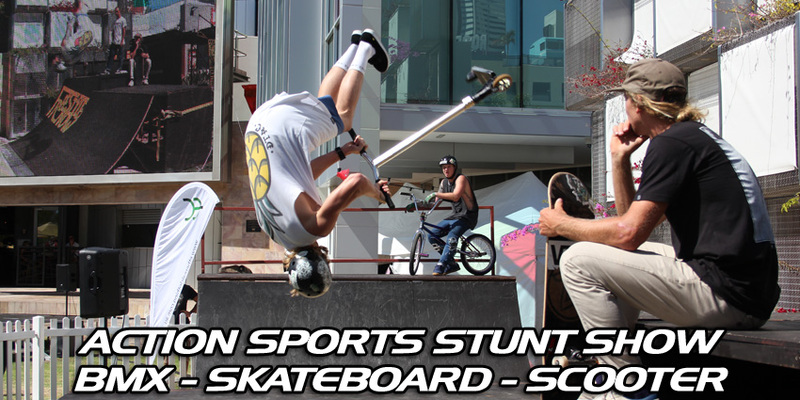 The Freestyle Now skatepark stunt show takes place on any skatepark that your venue, area, town or city may have. The Freestyle Now skatepark stunt show brings together professional BMX, scooter and skateboard riders into one action packed presentation. This show has up to 7 performers that use your skatepark to its fullest potential, performing a variety of BMX, scooter and skateboard stunts that will showcase the skatepark to potential users and spectators. 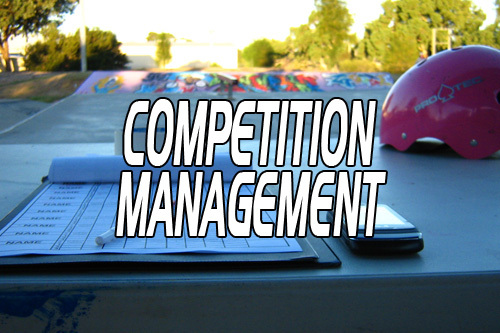 The Freestyle Now skatepark stunt show is 15 minutes in duration but can be adapted to suit your event if required. The set up for this show is minimal with only a P.A system required. This style of show is great if your event is at a venue that already had a skatepark within your parameters. The ability to include bmx, skateboard and scooter riders makes the performance very diverse. As no major infrastructure is required it can be very cost effective. 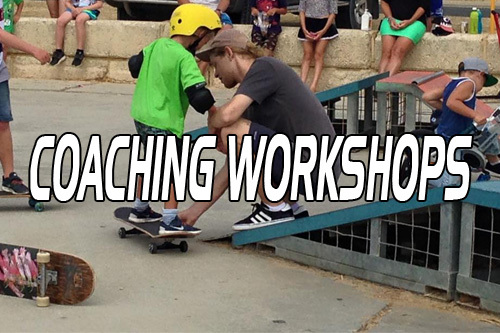 The skatepark stunt show is great for the opening of a new skatepark which can also be linked with a Freestyle Now skatepark coaching session. Please contact Freestyle Now if you require more information. Freestyle Now can offer your venue an entertainment package of hefty proportions. 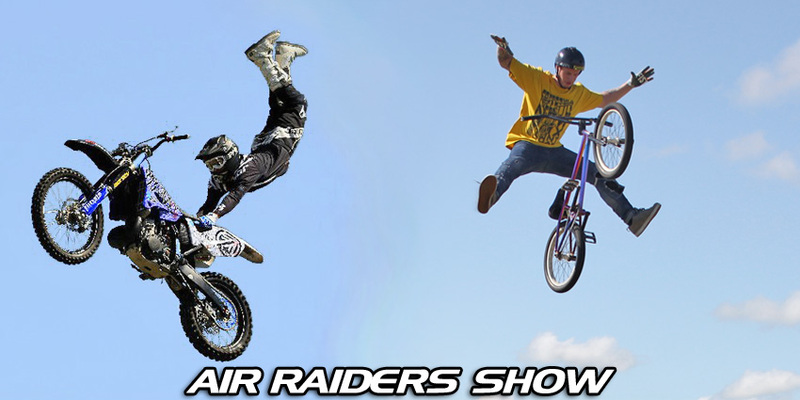 The Freestyle Now air raiders stunt show consists of BMX and Motocross stunt performers all blended together that will have your event patrons holding on to the edge of their seats. 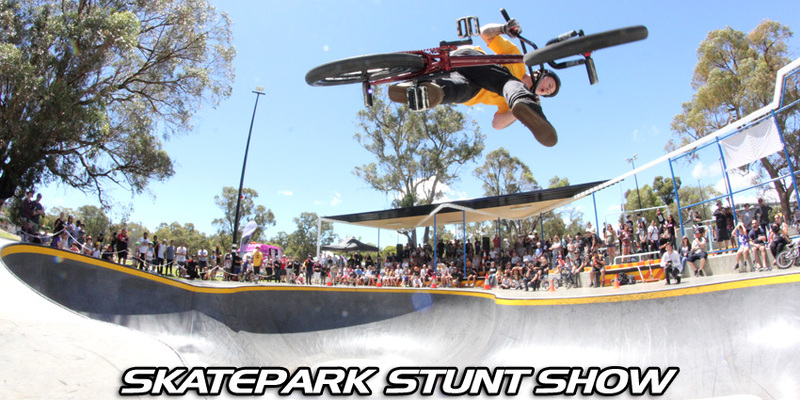 Professional BMX and motocross performers take to the sky and perform mid air stunts on BMX bikes and motorbikes that will give you the ultimate action experience. The greatest entertainment your event can have. Have you ever seen a back flip done on a motorbike, what about a front flip on a BMX bike? The professional performers do singular, double and triple routines throughout the show performance. The Freestyle Now air raiders stunt show is 15 minutes in duration but can be adapted to suit your event if required. The Freestyle Now air raiders stunt show can easily be set up in full set up on any flat level surface including pavement, grass, dirt and gravel with an approximate area of 50 meters x 20 meters with the opportunity to discuss smaller sizes if needed. Show set up and pack up time is approximately 1 ½ hours each. With prior organization quicker set up times can be arranged to allow for a quick in and out at different venues and shows. All required infrastructure is supplied by Freestyle Now, ramps, crowd control bunting, PA system, power cords (generator if required). This style of show performance is best suited to large oval venues and has been well received at agricultural shows and festivals. Please contact Freestyle Now if you require more information. Great for agricultural shows, festivals. Freestyle Now can offer your school a professional motivational presentation that can cater for all school ages. 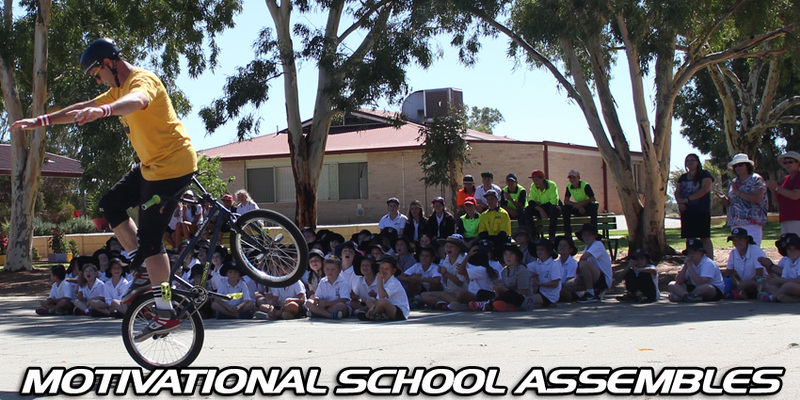 A Freestyle Now school presentation is a mix of awesome BMX, scooter and skateboard skills with positive messages and motivational speeches throughout the presentation to keep the students captivated and by doing this it opens up their minds to the presentation which helps for them to absorb the messages we promote. The physical presence of the Freestyle Now stunt squad jumping through the air with crazy stunts and spinning around in every which way on the ground will captivate not only the students but the teachers as well. We harness the crowds enthusiasm and create a presentation that shows how if you can have a passion for something you are able to achieve any goal you desire. 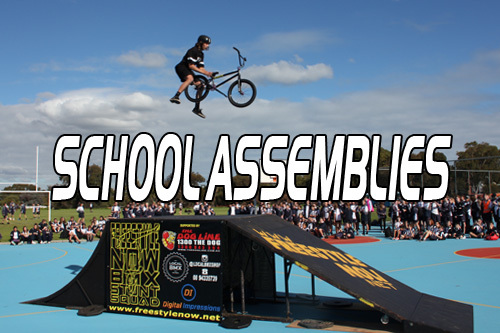 More information can be found on our school assembles web page here. Please don’t hesitate to contact Freestyle Now today for pricing and any relevant information you may require. Freestyle Now can deliver to you and your patrons a performance that will be an all out awe-inspiring display of action stunts like no other! A comprehensive list of our past shows can be found here.